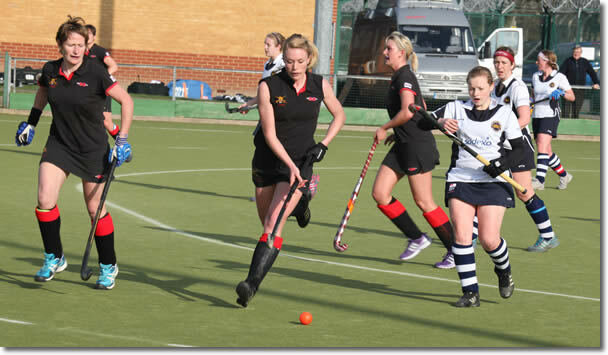 The 2011/2012 season has been excellent for the Army Ladies Hockey Team, retaining both the Indoor and Outdoor Inter Services titles and gaining promotion to the National League Division 2 Indoor tournament. As the results indicate, they were very hard fought, close matches. Horsham and Surbiton finished 1st and 2nd respectively and are promoted to Division 1. We are very proud to have qualified for the Division 2 tournament which meant that we retain our National League Division 2 status for the 2012/2013. We received a huge amount of praise and respect from the TD, Officials and all of the other teams. Everyone was very impressed with our performance, attitude and work ethic with such a small squad. Due to the success of the Indoor season, the outdoor season was delayed until Sun 12 Feb however unfortunately this had to be cancelled due to the snow and frost. Therefore we only had 1 training session and match on Sun 26 Feb from which to select the Inter Services squad. The match against the Civil Service at Aldershot resulted in a convincing win for the Army. A squad of 16 players were selected for the build up training and Inter Services Tournament over the period 08 - 14 Mar. A training match was played away against Henley on Thur 08 Mar followed by a match against a selected England Masters team on Sun 11 Mar at Aldershot. We won the match against Henley and despite losing against the England Masters team it proved an invaluable experience for the Army girls. The Inter Services tournament was very close this year with the Army battling hard for their 1 - 0 victory over the RAF and 2 - 0 victory over the Royal Navy. This has been an excellent season for the Army Ladies hockey team and we are very proud of our achievements. There were approximately 20 active players in the squad this season including some promising youngsters and we are due to have approximately 7 more players returning from Op Herrick for 2012/2013 and some talented OCdts due to commission from RMAS over the next year. This website is not an official MOD site it is privately owned by the Army Hockey Association.